"While in Logan County, I visited in some homes where lived descendants of Ephraim McLean, the first minister ordained in the Cumberland Presbyterian Church. 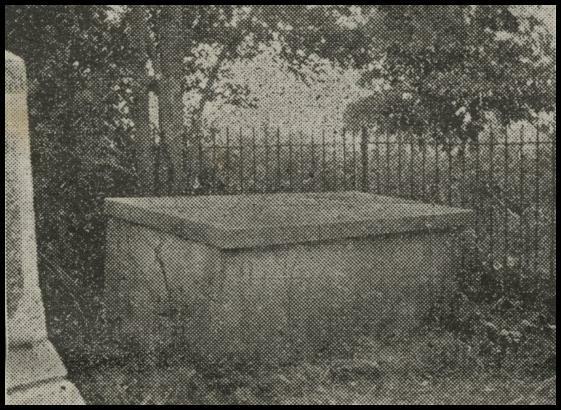 I learned that his grave was on what is called the Long Farm, and in company with several others, I visited the spot, and took a picture of the vault for the benefit of the Cumberland Presbyterian readers. From an old family tree, I learned that Ephraim McLean was six feet, two inches tall, and weighed three hundred and thirty pounds without any surplus flesh. On Friday, February 2, 1810, Finis Ewing, living near Russellville, Ky., went to the home of Samuel King, and consulted with him about organizing an Independent Presbytery. From King's home, they went to Ephraim McLean's and spent the night of February 2. Ewing and King were ordained ministers, and McLean was a licentiate in the Presbytery dissolved by the Presbyterian Church. The next morning the three got on their horses and rode to Dickson County, Tenn., to the home of Samuel McAdow, an ordained minister in the dissolved Presbytery, arriving about sundown. They told McAdow of their desires. After all night spent in prayer, on Sunday morning, February 4, 1810, there being three ordained ministers present, the Cumberland Presbyterian Church was organized. Ephraim McLean was ordained, and I am told that a baby was baptized."